The most efficient solution for your professional labeling, filing and mailing needs, the LabelWriter® 450 saves you time and money at the office. 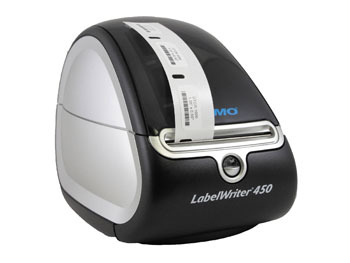 Connect a LabelWriter®450 to your PC or Mac® and you’re ready to print labels directly from Microsoft® Word or Outlook®, QuickBooks®, CardScan®, Mac® Address Book and other popular programs. Thermal printing technology eliminates the cost of ink or toner and the printer’s compact design makes it an easy and attractive addition to any modern workspace. "DTCR Series" labels are only compatible for use with Dymo® LabelWriters® purchased through Astral Scientific.